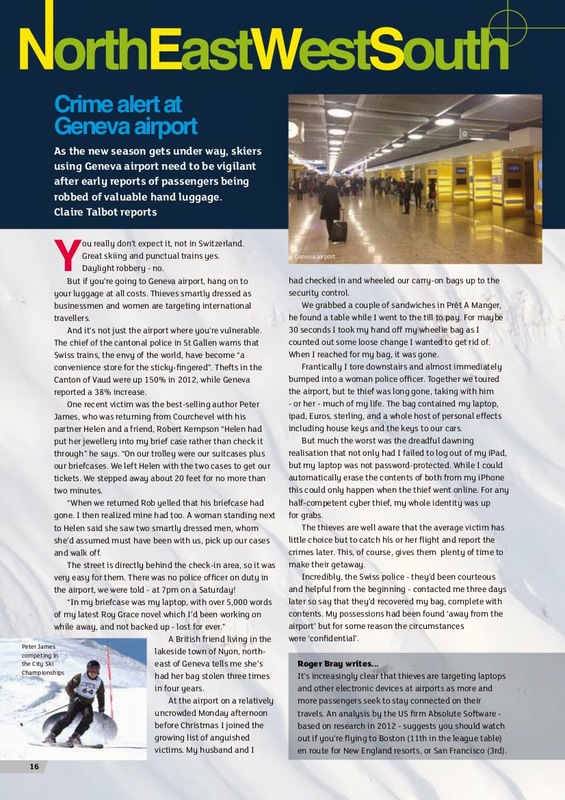 As the new season gets under way, skiers using Geneva airport need to be vigilant after early reports of passengers being robbed of valuable hand luggage. Claire Talbot reports. You really don’t expect it, not in Switzerland. Great skiing and punctual trains yes. Daylight robbery – no. But if you’re going to Geneva airport, hang on to your luggage at all costs. Thieves smartly dressed as businessmen and women are targeting international travellers. And it’s not just the airport where you’re vulnerable. The chief of the cantonal police in St Gallen warns that Swiss trains, the envy of the world, have become “a convenience store for the sticky-fingered”. Thefts in the Canton of Vaud were up 150% in 2012, while Geneva reported a 38% increase. One recent victim was the best-selling author Peter James, who was returning from Courchevel with his partner Helen and a friend, Robert Kempson “Helen had put her jewellery into my brief case rather than check it through” he says. “On our trolley were our suitcases plus our briefcases. We left Helen with the two cases to get our tickets. We stepped away about 20 feet for no more than two minutes. “When we returned Rob yelled that his briefcase had gone. I then realized mine had too. A woman standing next to Helen said she saw two smartly dressed men, whom she’d assumed must have been with us, pick up our cases and walk off. The street is directly behind the check-in area, so it was very easy for them. There was no police officer on duty in the airport, we were told – at 7pm on a Saturday! A British friend living in the lakeside town of Nyon, northeast of Geneva tells me she’s had her bag stolen three times in four years. At the airport on a relatively uncrowded Monday afternoon before Christmas I joined the growing list of anguished victims. My husband and I had checked in and wheeled our carry-on bags up to the security control. We grabbed a couple of sandwiches in Prêt A Manger, he found a table while I went to the till to pay. For maybe 30 seconds I took my hand off my wheelie bag as I counted out some loose change I wanted to get rid of. When I reached for my bag, it was gone. Frantically I tore downstairs and almost immediately bumped into a woman police officer. Together we toured the airport, but te thief was long gone, taking with him – or her – much of my life. The bag contained my laptop, ipad, Euros, sterling, and a whole host of personal effects including house keys and the keys to our cars. But much the worst was the dreadful dawning realisation that not only had I failed to log out of my iPad, but my laptop was not password-protected. While I could automatically erase the contents of both from my iPhone this could only happen when the thief went online. For any half-competent cyber thief, my whole identity was up for grabs. The thieves are well aware that the average victim has little choice but to catch his or her flight and report the crimes later. This, of course, gives them plenty of time to make their getaway. 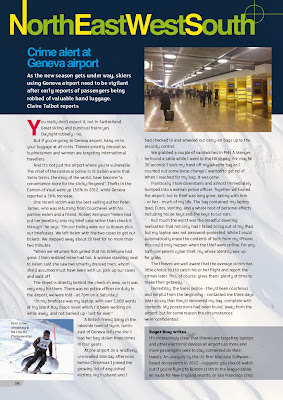 Incredibly, the Swiss police – they’d been courteous and helpful from the beginning – contacted me three days later so say that they’d recovered my bag, complete with contents. My possessions had been found ‘away from the airport’ but for some reason the circumstances were ‘confidential’. It’s increasingly clear that thieves are targeting laptops and other electronic devices at airports as more and more passengers seek to stay connected on their travels. An analysis by the US firm Absolute Software – based on research in 2012 – suggests you should watch out if you’re flying to Boston (11th in the league table) en route for New England resorts, or San Francisco (3rd).